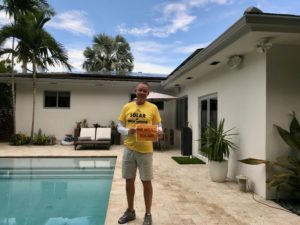 Award winning meteorologist, John Morales of NBC 6 in South Florida went solar in 2018 with Solar United Neighbors. Check out his video testimonial! “Meteorological summer is over and I’ve received my final summer bill from the power company. 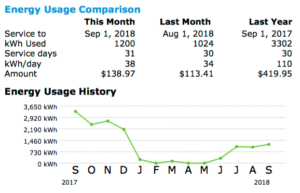 During these hot months, I can’t produce enough solar energy to have a $9 monthly bill like I did in winter and spring. But the savings are impressive nonetheless. Last summer I spent $1,274.09 in electricity, an average of about $425 per month. This summer I spent $373.25 total, for an average of about $124 per month. That $900 saved represents nearly 4% of the investment for my rooftop solar panels. I am on pace to have recovered my cost in 6 to 7 years. Note: I have a large solar array, a total of 49 panels with capacity to produce 14.7 kWh. I’m also charging an electric vehicle every day. More information about solar co-ops available at FL SUN.